Here we follow the story of a 5 1/2 year old orphan from the Philippines who is undertaking Ponseti treatment for bilateral clubfoot. In order to maintain his confidentiality we are not using his real name. We will call him 'Sonny' in this article. To date he has not had any treatment for his bilateral club feet and he currently walks (and even runs!) on the sides of his feet. On 14 February 2011 he flew to Manila for treatment. As a background, the child also has other disabilities, which we will not venture into here as they are irrelevant. He has no developmental/learning difficulties. 17 Feb 2011: Consultation. Today we met up with Dr Aguilar of St Lukes Hospital, Quezon City, Philippines. She advised that Sonny's bilateral club feet were not complex and fairly flexible, so theoretically should respond to casting (this is prior to viewing the x-ray, so hopefully this stands true). Sonny will undergo approximately three months of casting and should hopefully not require an operation. Following this he will go into Ponseti Braces for nights and splints during the day time to give him some freedom. Today he had an x-ray of his feet. ABOVE LEFT: This is how Sonny walks. ABOVE RIGHT: You can see the lumps on Sonny's feet caused by him walking and running on the sides of his feet. 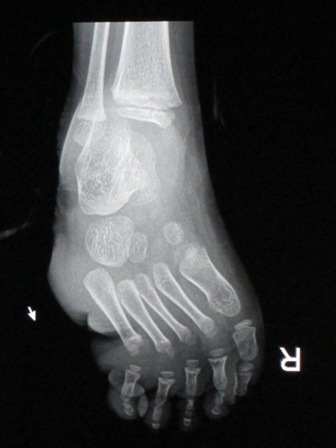 ABOVE: Sonny's feet on the x-ray table. 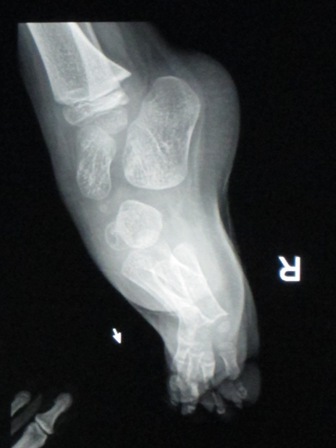 ABOVE: Sonny's right (R) and left (L) foot x-rayed front-on and in side view prior to any treatment for his bilateral club feet. Sonny is 5 1/2 years old. 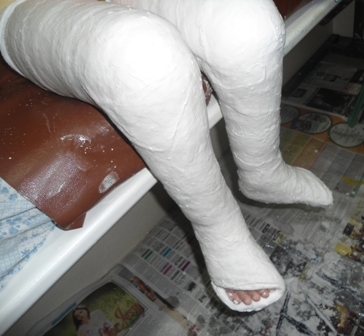 22 Feb 2011: Cast #1. Today Dr Aguilar set Sonny's first cast. A three month step towards correction! Sonny was extremely patient and co-operative! 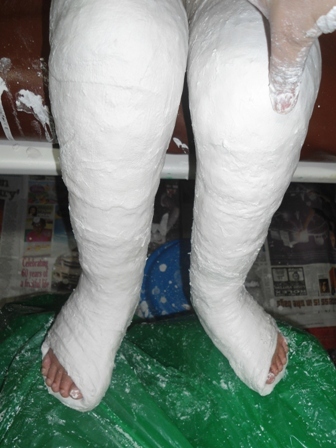 The casts are so neat that it already looks better - we can't wait for the result. It is important that we look out for any swelling or discolouration of Sonny's toes and we are to keep his feet raised for a couple of days. It is also important that the cast is not broken - something more common in boisterous five year old boys! 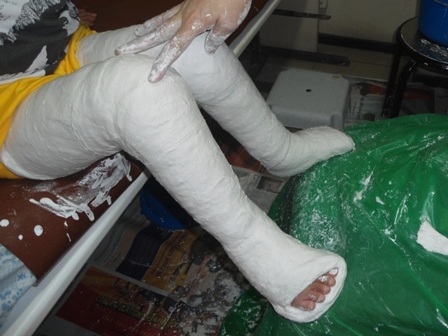 01 Mar 2011: Cast #2. We removed Sonny's previous casts today using a solution of two thirds vinegar and one third water. 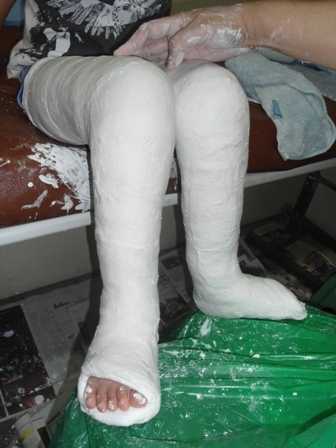 The casts are pretty robust in order to avoid breakage in older children, so it took us two hours to remove them. We used soaking, a stiff brush in order to find bandage ends, scissors, large scissors from a hardware store and a serrated knife. It was hard work! Doctor Aguilar suggested a bread knife (we used similar with some success) and/or a hack saw/small saw from a hardware store (we'll try this next week). We are expecting to get faster at removing the casts as time goes on. After the casts were removed Sonny had a shower and we proceeded to St. Lukes Hospital in Quezon City to meet Dr. Aguilar. Sonny was very patient and was re-cast with no problems. Sonny seems to be progressing as normal, although there is little to see at this early stage. ABOVE: Cast #2 completed. The grey area is to preserve Sonny's dignity as he was only wearing underpants in order that the cast could be made to the top of his thigh as per proper Ponseti methodology. 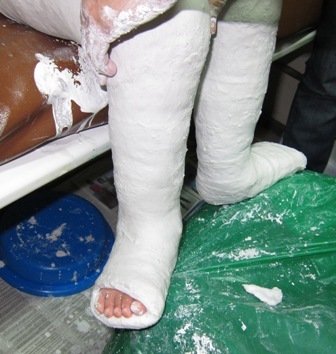 08 Mar 2011: Cast #3. Sonny's previous cast came off much easier this week. The main difference was that we used warm water and vinegar mixture rather than room temperature water and vinegar. Sonny was very patient at the hospital. His feet are beginning to show improvement, particularly the less severe left foot which has good flexibility. Dr Aguilar put Sonny back into his third set of casts. Sonny was extremely good, even though there were a few tears as his foot was manipulated - as the bones go in/change position in the foot they can hurt. ABOVE LEFT: Sonny's feet after removal of Cast #2. ABOVE RIGHT: Sonny's feet in Cast #3. 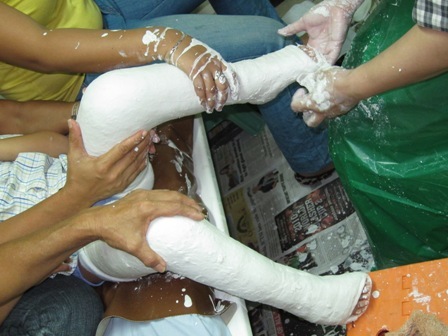 15 Mar 2011: Cast #4. Sonny's previous cast came off quickly and easily today. Sonny's feet are doing real well, you can begin to see some significant improvement now. His feet are flexible, which is great news. Sonny was happy today, no tears and lots of thumbs up! ABOVE: Cast #3 came off relatively easily in warm water and vinegar. ABOVE LEFT: Sonny's feet after removal of Cast #3. ABOVE RIGHT: Sonny's feet in Cast #4. 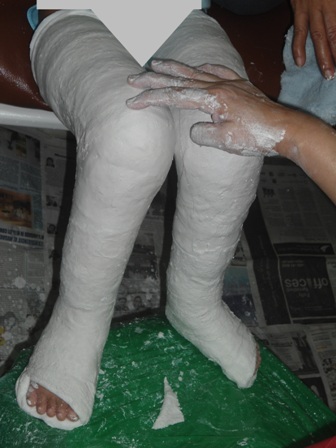 22 Mar 2011: Cast #5. Things are routine for Sonny now. 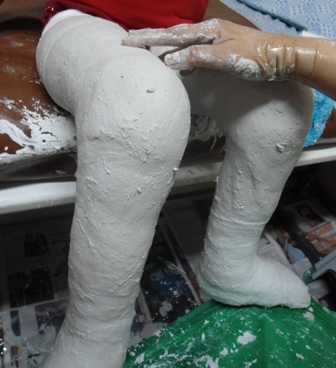 His feet show gradual improvement and we just have to be patient with the casting process. Sonny gets around in a wheelchair in the meantime and is enjoying life! ABOVE LEFT: Sonny's feet after removal of Cast #4. ABOVE RIGHT: Sonny's feet in Cast #5. 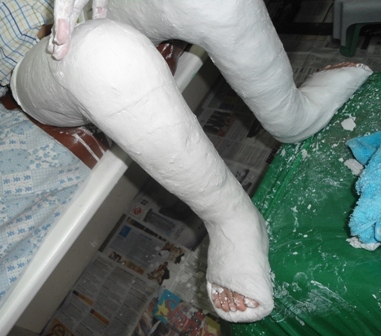 29 Mar 2011: Cast #6. ABOVE LEFT: Sonny's feet after removal of Cast #5. ABOVE RIGHT: Sonny's feet in Cast #6. 05 Apr 2011: Cast #7. ABOVE LEFT: Sonny's feet after removal of Cast #6. ABOVE RIGHT: Sonny's feet in Cast #7. 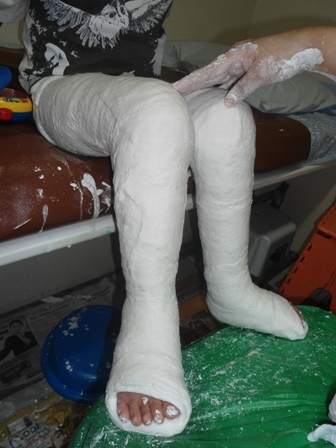 12 Apr 2011: Cast #8. ABOVE: Sonny's feet after removal of Cast #7. ABOVE RIGHT: Sonny's feet in Cast #8. 19 Apr 2011: Cast #9. ABOVE: Sonny's feet after removal of Cast #8. ABOVE RIGHT: Sonny's feet in Cast #9. 26 Apr 2011: Cast removed. Due to swelling, Sonny's cast was removed early. 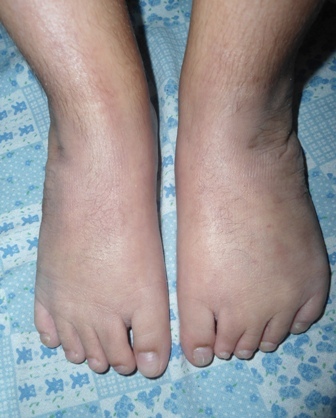 ABOVE: Sonny's feet after removal of Cast #9 early due to swelling. 28 Apr 2011: Cast #10. ABOVE: Sonny's feet in Cast #10. 05 May 2011: Cast #11. ABOVE LEFT: Sonny's feet after removal of Cast #10. ABOVE RIGHT: Sonny's feet in Cast #11. 12 May 2011: Cast #12. ABOVE LEFT: Sonny's feet after removal of Cast #11. ABOVE RIGHT: Sonny's feet in Cast #12. 19 May 2011: Cast #13. ABOVE LEFT: Sonny's feet after removal of Cast #12. ABOVE RIGHT: Sonny's feet in Cast #13. 26 May 2011: Cast #14. ABOVE: Sonny's feet after removal of Cast #13. ABOVE: Sonny's feet in Cast #14. 02 Jun 2011: Cast #15. Sonny's right foot (the worst one initially) is slow to correct. At this point the progress is very slow, but castings continue and it comes around eventually. ABOVE LEFT: Sonny's feet after removal of Cast #14. ABOVE RIGHT: Sonny's feet in Cast #15. 09 Jun 2011: Cast #16. ABOVE: Sonny's feet after removal of Cast #15. ABOVE: Sonny's feet in Cast #16. 16 Jun 2011: Cast #17. ABOVE LEFT: Sonny's feet after removal of Cast #16. ABOVE RIGHT: Sonny's feet in Cast #17. 23 Jun 2011: Cast #18. ABOVE: Sonny's feet after removal of Cast #17. ABOVE: Sonny's feet in Cast #18. 30 Jun 2011: Cast #19. Sonny's left foot is now perfect, but the right foot needs a little more work to bring the heel down, hopefully without an operation. His left foot is still being cast in order to maintain the correction. ABOVE LEFT: Sonny's feet after removal of Cast #18. ABOVE RIGHT: Sonny's feet in Cast #19. 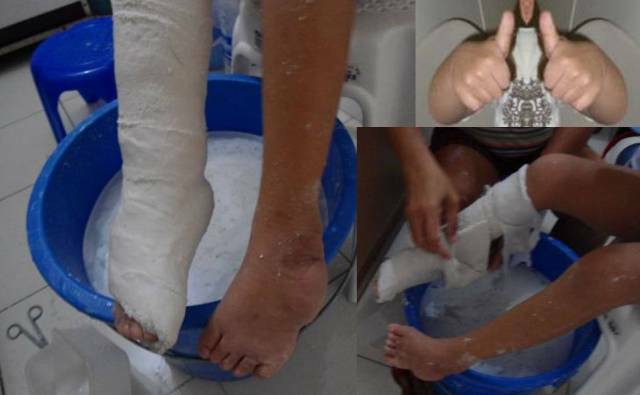 12 Jul 2011: Cast #20. Sonny's left foot remains perfect but continues to be cast in order to hold the correction. His right foot is still twisted in a little near his toes and still needs over-correcting. It is looking hopeful that he will not need a tenotomy, but his right heel needs to come down a little still. After a couple more casts he will probably go to brace wearing and if necessary have a tenotomy at that point. ABOVE LEFT: Sonny's feet after removal of Cast #19. ABOVE RIGHT: Sonny's feet in Cast #20. 22 Jul 2011: Cast #21. ABOVE LEFT: Sonny's feet after removal of Cast #20. ABOVE RIGHT: Sonny's feet in Cast #21. 02 Aug 2011: Cast removed. Due to swelling, Sonny's cast was removed early. 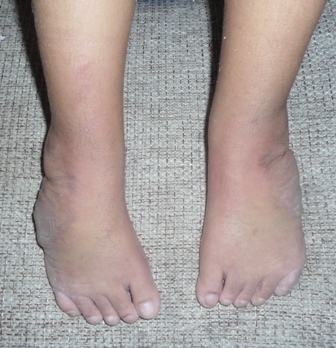 ABOVE: Sonny's feet after removal of Cast #21 due to swelling. 05 Aug 2011: Cast #22. ABOVE: Sonny's feet in Cast #22. 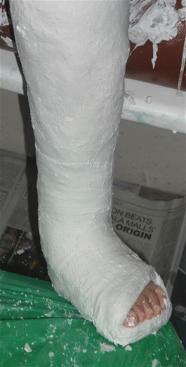 14 Aug 2011: Cast #23. Unfortunately no image available of Sonny's feet after removal of cast #22. ABOVE: Sonny's feet in Cast #23. 31 Aug 2011: Cast #24. ABOVE LEFT: Sonny's feet after removal of Cast #23. ABOVE RIGHT: Sonny's feet in Cast #24. 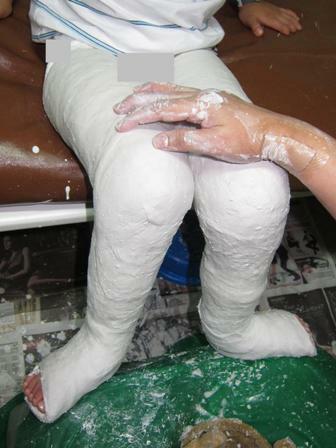 08 Sep 2011: Cast #25. This is planned to be Sonny's final cast and we are instructed to order his Ponseti AFO Braces. ABOVE LEFT: Sonny's feet after removal of Cast #24. ABOVE RIGHT: Sonny's feet in Cast #25. 22 Sep 2011: Ponseti Shoe Fitting. Sonny's feet are now ready for his Ponseti Shoes. 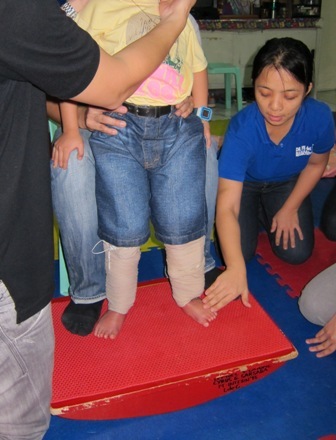 We ordered the shoes about a week ago from MD orthopeadics and they arrived in the Philippines in 3 days! His first shoes are size 7. Dr Aguilar gave instructions on how to fit the shoes. Sonny will have another check-up in a week. So long as thing look good we expect him to have therapy after that so that he can learn how to walk. At the moment Sonny is in his braces for 23 hours a day. We will be be ordering a set of day braces in the coming weeks. Sonny was very happy with his shoes! ABOVE: Sonny's feet after removal of Cast #25. ABOVE: Sonny's Ponseti AFO Brace fitting being demonstrated by Dr. Aguilar. 29 Sep 2011: Check-up. Sonny visited Dr Aguilar today to see how his feet were doing in the Ponseti shoes. Sonny is doing well. His right foot still needs the heel to come down a little more. The hope is that it will come down naturally by wearing the Ponseti shoes. If this does not happen we will need to consider a 'partial' tenotomy to lengthen the tendon without fully cutting it. This is because in older children (over 2 years old) the result is not known if a full tenotomy is performed. Dr Aguilar gave the go-ahead for Sonny to have therapy to enable him to walk. 01 Oct 2011: Consultation and Therapy. Sonny had a consultation with Dr Garcia at the Department of Rehabilitation Medicine, Fe del Mundo Medical Center in Quezon City. This was followed by a 1.5 hour therapy session. Sonny is undergoing post-casting therapy to stretch and strengthen his muscles and ankles as well as gait re-training. This involved massaging his muscles and also applying small electrical shocks to the muscles. Sonny found this first session very hard. Sonny very rarely cries: He is very brave, but in this session he cried 3 times, so it was obviously painful. One issue was a lack of distraction, despite our best attempts. To remedy this I bought him a hand held playstation, which I think will help keep his mind off of what is happening as he loves computer games. Sonny will initially undergo this treatment every day for 2 weeks (excluding Sunday). Treatment will then be reviewed depending on progress. Dr Garcia also suggested taping the toes (using micropore tape) whilst in the brace to try and straighten them. Dr Garcia also said that Sonny had Bell's Palsy and thus his treatment will include some facial massage and small electric shocks to try and stimulate the left side of his face. Oct 2011 - Apr 2013: Check-ups. Numerous quarterly check-ups with Dr. Aguilar with no problems. Sonny has been wearing Ponseti braces at night and locally made supports in the day. 18 Apr 2013: Check-up. Today Sonny had a check-up with Dr. Aguilar. Sonny's heels are coming up at the back. He adjusts his knees to keep his feet flat on the ground. It was decided that a tenotomy of both feet was required. This will involve cutting the Achilles tendon. As Sonny is now 7 and the effect of completely cutting the tendon at this age is uncertain, he will instead have 3 partial cuts to the tendon. Babies normally have a complete cut as it is known to be OK at this age (and some doctors perform a complete cut even in older children). Sonny is scheduled for this out-patient procedure on 27 April 2013. He will then be in plaster for two weeks. Sonny is no longer required to wear the in-sole supports he had. 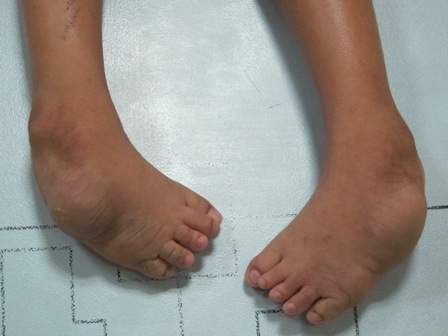 ABOVE: Sonny's feet nearly 2 years after treatment started and prior to a tenotomy. To the left is one of the in-sole supports he was using inside his shoe. He will now stop using this. He continues to wear Ponseti Braces at night. 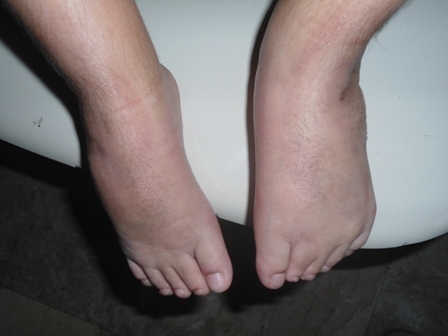 ABOVE: Sonny's feet on 18 April 2013, around 2 years after treatment started. He now requires a tenotomy. Note how his cald muscles are thinned. 27 Apr 2013: Tenotomy. Today Sonny had a tenotomy on both feet. The operation was performed under general anaesthetic. (Sonny had to go to the hospital two days before the operation for a chest x-ray and blood/urine analysis then be cleared by a peadatrician for the anaesthetic). Sonny is now 7 years old, so Dr Aguilar decided to make three cuts in the achilles tendon rather than a single complete cut. A single complete cut is performed on babies and, by some doctors, in older children. 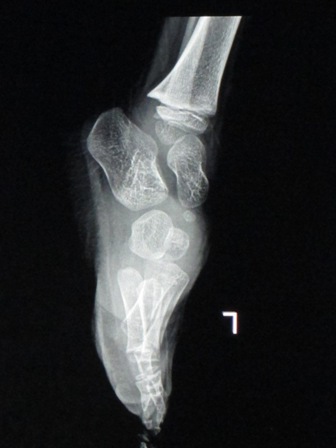 Dr Aguilar took a cautious approach as she says that the result of a complete tendon cut in older children is not fully known (although probably OK), with babies it is known to be fine. The operation took around 1 hour, although obviously longer including anaesthetic and recovery time (most of the day). 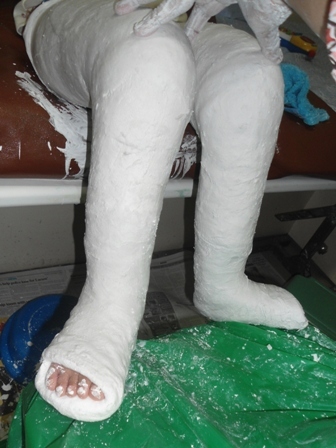 After the operation Sonny was immediately placed in casts in a typical Ponseti position. As it was an out-patient procedure, he was released the same day. The cast will be worn for about 2 weeks. Small signs of blood may be evident on the casts where the cuts were made. 30 Apr 2013: Check-up. Today Sonny had a check-up with Dr. Aguilar to ensure the casts were good. 09 May 2013: Check-up & cast removal. Following the tenotomy Sonny was in Ponseti casts for two weeks. I'm afraid I did not photograph this, but the cast is basically the same configuration as the final Ponseti casts. His casts were removed prior to his visit to Dr Aguilar. His feet were much better now and visibly flatter on the ground. He can't walk yet - he is very weak on his feet. Sonny will now undergo therapy for two weeks in order to get him walking again. In this time he will also have a new day in-sole made. This will fit into his shoe and help to keep the proper shape and arch of his foot. 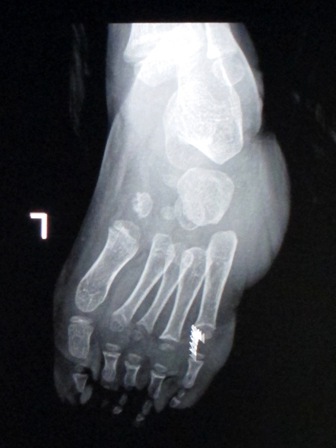 ABOVE: Sonny's feet on 09 May 2013 following his tenotomy and casting for two weeks. 30 May 2013: Check-up. Sonny's special insoles arrived. He had a check-up and the insoles fitted was given the all-clear to return home. Sonny has been having therapy for the last 3 weeks, 6 days a week. When he returns home he will continue to have therapy 3 times a week. 04 July 2013: Check-up. Sonny had another check-up. His feet are doing well. In order to free Sonny up for school the therapy will now end. Therapy was principally designed to get him walking again after the castings and after the tenotomy. We will keep a close eye on his feet. In the meantime his carer will continue to do tip-toe exercises with Sonny and use a Thera-Band and also ensure Sonny does some sports and running around - using his feet. Tip-toeing is not recommended for all kids, but is appropriate for Sonny. Sonny continues to wear Ponseti Braces at night. 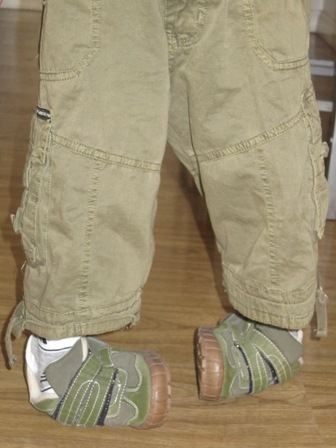 In the daytime he wears regular sandals or shoes with a special insole to hold the arch of his foot correctly. Dr Aguilar looked at arch pads, but concluded that the specially made insole was better at the moment. ABOVE: Sonny's feet on 04 July 2013. Note the thinned calf muscles. ABOVE: The tenotomy scars on the back of Sonny's legs. He had 3 partial cuts to the tendon. ABOVE: Dr Aguilar tried out these arch pads, but decided not to use them yet. ABOVE: Trying out the arch pads. Sonny's specially made insoles are behind his feet. ABOVE: Sonny wearing his specially made insoles. ABOVE: Sonny doing his tip-toe exercises.